Understandably, the first bit of business in need of discussion has to be The Flash’s closing “King Shark” reveal of Zoom’s identity, which is almost unfortunate, considering how strongly the hour preceding it rebounded from a double-header dive into that aspect of Season 2. Not only that, but unmasking Zoom as someone who looks exactly like Jay Garrick doesn’t illuminate very much beyond what most had already put together in recent weeks, at least on the surface. I’ll direct you to avoid this paragraph for fear of spoiler warnings, but post-mortem interviews making the rounds between Entertainment Weekly, TVLine and Variety all seem to feature producer Andrew Kreisberg conclusively identifying the unmasked Zoom as the same “Jay Garrick” we’ve been following all season, rather than another doppelganger, or the Hunter Zolomon we saw weeks ago. That’s a particularly odd thing to do, given the ending of “King Shark” didn’t make that at all explicitly clear, and either way, there’s too much unknown for any real reaction here. Zoom even still had the body of a Jay Garrick in his arms, lest we think it a speed mirage, so who knows what we really saw? I almost wish “King Shark” hadn’t ended with such a scene-stealing reveal, given the surprisingly robust hour that could just have easily slacked off after such a driven two-part “Earth-2” arc. King Shark isn’t a particularly complicated* villain either, fan-favorite and impressive though he may be, and the bigger achievement seemed to be that that the hour wove some surprisingly emotional stories around it. Not only did Barry come to terms with the weight of all he’s been responsible for over the last year in a cathartic way, but we also spent time examining Caitlin and Cisco’s grief over Jay and Killer Frost, even tossing in West family drama with Wally’s resentment of Barry. *The actual characterization leans a bit more unintelligent, and I question the choice of King Shark’s excessive size, given how it complicates action staging, but it was especially strong to center the pursuit in some actual marine biology, and even flesh out the character’s prior human identity. It even seemed tacitly optimistic, that they’d bring in his Earth-1 wife to potentially treat him after capture. "Tread lightly on the 'Parallel Universe Man-Shark' thing. It took me a season and a half." It felt like “King Shark” got to both have and eat its cake at certain points, picking up immediately after Jay’s apparent demise to frame that moment around its effect on Caitlin, yet still lurch forward a bit with Barry narrating the days to come, and the effort to distance themselves from the events of Earth-2. The Flash hasn’t always known what to do with Caitlin, and even in the pilot, it seemed the character’s entire arc was to muster a smile after losing her fiancée. Killing Jay might almost have retreaded that (and good luck with the Zoom reveal, Ms. Snow! ), but I like that “King Shark” used a different lens to thaw that particular iciness, as Cisco projected her mood into what he knew of Killer Frost. Secrecy has almost always proven a source of frustration for Arrow-verse plots, but here it actually seemed reasonable to downplay the Earth-2 experiences, at least at first. It doesn’t do too many favors to Caitlin as a character, to keep that interior life walled off from the audience, but seeing a would-be Killer Frost through Cisco’s eyes at least livened up the bitter dynamic between the two, feeling all the more cathartic for Caitlin to inevitably unburden herself, and return to a more playful friendship by the end. The only aspect of tonight’s outing that might have benefit from a little tightening was the connection between Barry’s own grief to whatever sibling rivalry had flared up with Wally, especially after that moving confession of Barry’s Earth-2 experience to Joe and Iris. Grant Gustin managed to make those events much more real and affecting in the description than what we actually witnessed last week, almost justifying his bizarre early abandonment of the mission, and very much drove home the final decision not to say goodbye to Zoom or his parallel world. Just a very clean arc overall, that platitudes like Diggle’s worry about Barry shouldering the weight of the world almost make a literal sense over Earth-2, when again, we’d have been happy with an hour’s worth of Jaws references. Somewhere, Roy Scheider is spinning in his grave. Of course, it goes without saying that the King Shark bits themselves were a marvel, not just for the astonishingly well-realized and choreographed effects, but also the balance of working around such an expensive creation. Jaws itself perfected the notion of making what you don’t see scarier than what you do, and the hour gave a reasonable balance to both sides of that equation. Adding Diggle and Lyla into the mix was almost window dressing to all the fun, but even then, David Ramsey always gives great stupor. We’ve a couple weeks now to digest that final Zoom twist, but this was still a surprisingly strong hour to close out on. Whatever minor quibbles one might have, The Flash still ran on water and threw lightning at a giant shark! How bonkers-great is this show, and where’s the damn ceiling? One of my early notes: “AQUARIUM LASER POOL.” This pleases me. So Lyla did actually take the job as head of A.R.G.U.S. Anyone else notice the reluctance to say Suicide Squad in talk of weaponizing King Shark? The Spielberg references were all on point, nicknaming him “Bruce,” or the first scene’s resemblance to Jurassic Park. Who has that many solo cups, and isn’t playing a drinking game? How close to water could the West house be, that no one reported King Shark stalking through the streets? Then again, you could say the same of his first appearance outside Jitters. Come on Wally, you can put The Flash’s identity together. It has to be weighing on Iris that both the future, and alternate realities have seen her married to Barry, yes? 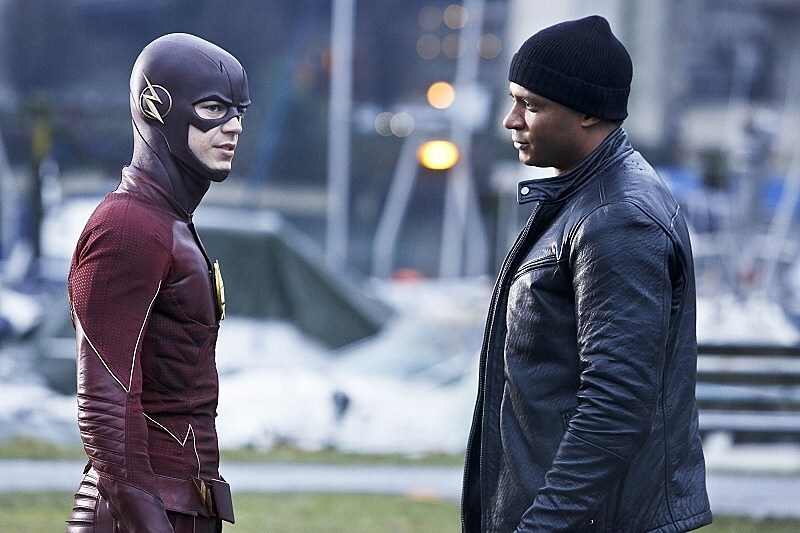 The Flash Season 2 will return March 22 with “Trajectory,” airing at 8:00 P.M. on The CW.